Millions of people learn French but only a very small percentage of learners can actually speak it fluently. Why is that? People in general are quick to point out that some are naturally built more than others to learn French and other languages. This is not necessarily true, however, since we have all come to learn and speak our native language fluently. 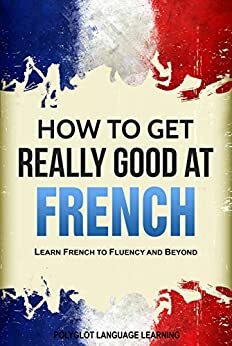 If you find yourself overwhelmed trying to memorize thousands of French vocabulary words or grammar rules or are struggling to speak French with native speakers, try this book! This is not a basic French for beginners textbook designed to teach French but a book that will teach you how to learn French the smart way and get you to fluency faster using highly effective language learning methods and techniques. There exists hundreds of French language coursebooks, French phrase books, and basic French for beginners textbooks, but without smart language learning techniques and strategies, you are likely to forget what you have studied and reviewed and especially during a conversation. There exists an easier and more fun way to build your overall French language ability. In How to Get Really Good at French, discover how you can easily conquer French language learning using highly effective methods and strategies used by polyglots (language learning experts). These methods and techniques can even be used to learn French vocabulary, grammar, and phrases from TV shows, videos, music, and video games. Learn French smarter and faster starting today! 4.0 out of 5 starsGood ideas, easy read. I thought there were a number of good ideas presented in this book, and I've put some of them into action. Since then I've found that I'm learning more and having more fun doing it. Good, detailed and practical advice. The book is easy to read and fairly short. This is basically a guide to studying languages for someone who perhaps doesn't want to use the internet for study tips, but everything here can be found within an hour on all the language learning sites. Also a chapter is dedicated to explaining Anki, which I found odd since a. there are already many guides to Anki online, including the ones created by Anki which do a good job and would be present at the site of download, and b. Anki's not a particularly complicated concept to explain–it's a flashcard site with audio. I guess the title should have warned me. There is no actual teaching of French, only suggestions about HOW to learn -- things like flash cards and practicing every day (hmmmmm, like I hadn't thought of those on my own!) Definitely not worth even the 99 cents. The one suggestion with merit (in my opinion) was to read materials written in French so I've purchased a children's book as a starter.